Have you ever wondered why we put off doing something that would have only made life easier? That’s what I wondered about for a long time in regards to our bottle lamp video. It was late one evening (3:00 a.m. to be exact), that an epiphany of sorts came to me. 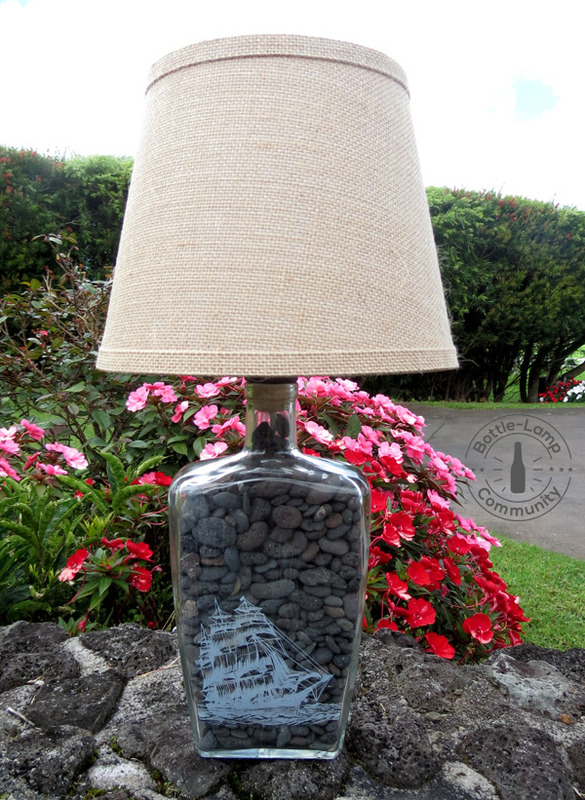 The Bottle Lamp website had been up and running for over five years now and I was always under the assumption that we had covered every aspect of the bottle lamp making process. From tools of the trade to wiring techniques. But one of the most obvious things that was missing was a video that showcased the whole process. This seemed like more than just an over site on my part. This was a huge error that needed immediate attention. On the home page we always show cased different videos. From drilling and cutting bottles to reviews of different tools that help simplify the process. If someone was visiting for the first time they would see this prominently displayed almost at the top of the page. Now if you did a search for ‘How To Make A Bottle Lamp‘, and the Bottle Lamp website came up at the top of the list in the search engine query you’re more than likely going to go there expecting to find the information that you need to do exactly that. Up until now that hadn’t really been the case. Righting the wrong. This was huge. I was itching to get going and was really trying to pitch this idea to Silke. We needed to make this video. Like yesterday. She wasn’t as ‘gung ho‘ about making another video as I was and it was starting to feel like I was selling ice cubes to Eskimos. This was my big sell: “This is possibly the most important video that we ever made, in the history of us making videos.” This heavily dramatized statement caught her attention and she gave me a look like she was waiting for the punch line. She saw I was serious but had to break out laughing. It was over the top and I really don’t think she felt as passionately about it as I did but that really didn’t matter. She was on board and that was what counted. The video making process. One of the main reasons I really needed Silke’s approval for this was that she’s the one who has been instrumental in putting almost all of the videos together. I’ve put a few together myself and they turned out o.k. but this one had to have everything going for it. I always have trusted her instinct on how the videos look and feel so having her on board was huge. The header image and all the editing was crucial. I’m not the best person to have acting these out but with her editing I somehow come off looking coherent and actually semi intelligent. We needed this to be all those things and so much more. Lights, camera, action. We are currently care taking in Hawaii and so all of my tools are back home in a storage shed. This actually worked to our advantage. One of the things that I wanted to show in the video was that with a few simple tools, the viewer could make a bottle lamp themselves. If we had shot this at home I would have simply pulled out my drill press and had the hole drilled in seconds. Obviously not everyone has a drill press in their house. A corded or cordless drill is more likely. Being able to keep the process simple allows a much larger demographic of people to be able to relate to your concept. With all the tools and equipment lined up we were ready to start rolling. It took a couple takes and their was some scenes that had to be re-shot but we eventually got it done. The longest part of all this is the video editing. We had recently upgraded our video editing software to Corel VideoStudio Pro X8. Prior to this we had run a much older version so we knew the lay of the land when it came to utilizing the tools that came with it. Never the less, there was a little bit of a learning curve that came with putting it all together. There was a lot more that we were able to do with the text manipulation. One of the things that the video had was a recurring list that showcased the steps that were needed to complete the process. The list would re-appear with the addition of the next step. I really like how this turned out because it drove home what we were trying to show in the video. Let it roll! Silke was patient enough to get all the editing done in one setting. We would look at how things had come along so far and then continue on. This back and forth process may have taken a little longer but we were able to make sure that it had a good flow to it and didn’t drag out too long in certain places. 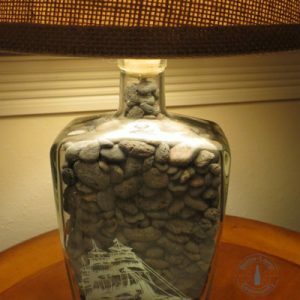 The bottle lamp drilling process can be tedious and I really didn’t want to put our viewers to sleep watching this. With a couple of cuts and splices we were able to shorten this down considerably and make it more viewer friendly. Good results? When you work hard to put something together you are always eager to get feed back about it. This little bottle lamp video was no exception. In 24 hours we had quite a few views, no comments and a thumbs down vote. I wasn’t too discouraged. There are a lot of haters out there and the thumbs down could be attributed to a random troll’s feedback. The views on the other hand were impressive. The numbers continued to grow but no real actual response. Time will tell. The final verdict. Two weeks after the release of the ‘How To Make A Bottle Lamp DIY’ video we have over 33,000 views. 396 thumbs up and the lonely one thumb down. As impressive as all that is, we still really have no viable real feedback on the video itself. No comments. All in all I’m happy with the way that the new video turned out and as they say ‘better late then never’. I think the new how-to video makes the whole bottle lamp making process easily accessible and offers a nice visual of the steps involved. What are your thoughts on this? Leave me a comment below.